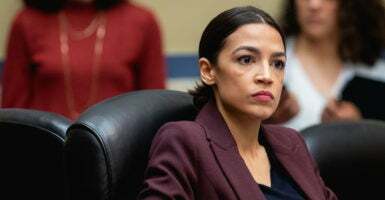 The New York congresswoman’s response came only hours after the Senate voted 57-to-0 to kill the Green New Deal, which was introduced by Ocasio-Cortez and Democratic Massachusetts Sen. Ed Markey. Three Democrats voted against the resolution: Arizona Sen. Kyrsten Sinema, West Virginia Sen. Joe Manchin and Alabama Sen. Doug Jones. The remaining Democrats, including Markey, all voted present. McConnell’s campaign account responded to Ocasio-Cortez on twitter saying, “im not owned! im not owned! !” with a photograph of her face morphing into a corncob.